The Spruce Creek Country Club complements the airport to provide our residents the option of a social country club atmosphere. While the club is a separate entity to the main community, various membership options are available. 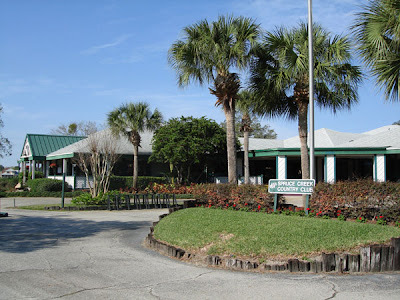 With an 18 hole course winding through wooded fairways and an established Clubhouse with adjoining tennis courts and swimming pool, the club has the amenities to allow its members enjoy life to the fullest in the Spruce Creek Fly-In. The Club's amenities revolve around its gracious clubhouse with lounge, formal dining room, dance floor, and superb dining and beverage service. 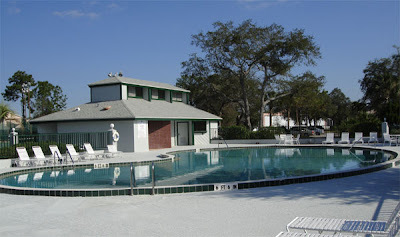 Outside the Clubhouse is a large swimming pool complete with pool house, gazebos, and changing and bath facilities. The pool's large sunning deck is usually teeming with guests enjoying social activities. The club facilities include a challenging eighteen hole golf course that winds through our wooded forests and creek. In addition, it has a practice area with putting greens, a driving Range with target greens and complimentary range balls, green side bunker and fairway bunker. The golf course features 6,894 yards of golf from the longest tees for a par of 72. The course rating is 73.1 and it has a slope rating of 128 on Bermuda grass. Designed by renowned Bill Amick and first opened in 1971, the course offers over 6,700 yards of carefully designed fairway, bunkers, lakes and beautiful manicured greens. 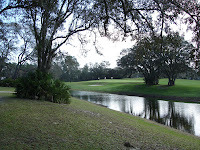 The front side of the course winds along historic Spruce Creek and its fairways are bordered by majestic southern oaks. The back nine offers spacious views where wind and water can challenge your play. The championship course is a wonderful challenge for golfers of all skill levels. Other amenities include golf instruction, golf club and cart rental and men's and ladies' locker room. The club has a cart only policy. 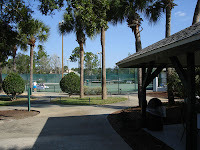 The tennis area includes eight lighted tennis courts (4 clay and 4 hard) with practice backboard and Pro Shop. From formal dining to casual entertaining, dining at Spruce Creek Country Club embodies a continuing commitment to good taste and exceptional service. The outstanding cuisine and personalized service of The Prop and Fore provides the ideal background to entertain your guests. 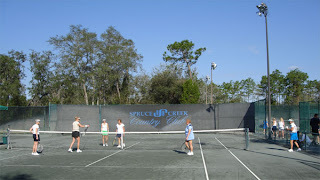 Snack bar, tennis and golf pro shops, golf instruction, fitness center, dining room and banquet facilities. Throughout the year the club provides a variety of activities which include but are not limited to: tournaments, member events, tennis events, golf events, dining events and specials, Christmas and other holiday special events and the always popular annual charity events. 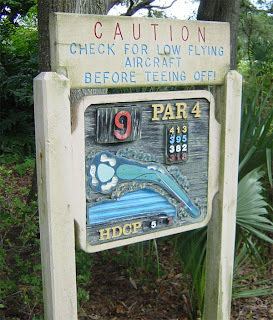 One of the best golf courses in North East Florida!, and you can't beat the airport. We often fly in our Bonanza for a few rounds, have a great meal at the restaurant and are home in the Atlanta area by sunset. Great Country Club in the middle of a pilot's dream community. 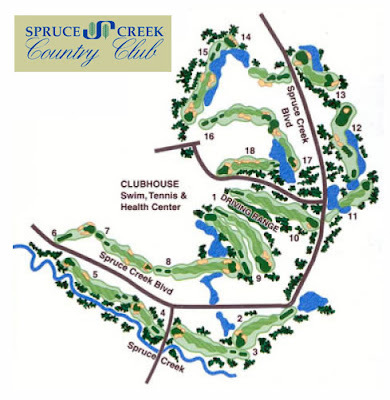 Here you can view Spruce Creek homes on the Golf Course This is the main real estate company in Spruce Creek. Heaven on Earth!, I say to myself everytime we come back to our Spruce Creek home. Gorgeous grounds, and what an incredible private airport! we were graciously invited by Carlos Bravo of Karlhaus Realty who has lived in Spruce Creek for many years and knows just about everything real estate there. We flew in our Citation from the Dominican Republic and the airport accomodated us very well. Thanks Carlos! we will be back.